I was perusing the Target grocery aisles the other day and came upon this yoghurt. I had tried most of the premium brands, Fage, Siggi’s, Chobani, etc… but I had never seen this brand, or never paid much attention. The container stated that it was an Australian culture made in a farm in Colorado with happy cows. The ingredients were all natural. That intrigued me enough to buy a container each of the passion fruit and strawberry rhubarb flavors. This yoghurt is very addictive. It is of the fruit on the bottom variety and has a very creamy consistency. It reminds me of traditional yoghurt, with the mouthfeel of Greek yoghurt. 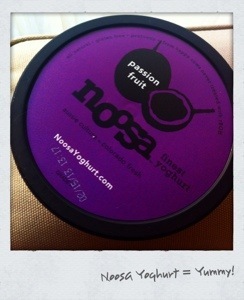 The passion fruit flavor actually contains real passion fruit, with seeds and everything! I want to eat a whole stub of this stuff. If you see this yogurt in your grocery store, please give it a try! I just tried this a few days ago and I’m addicted! The strawberry rhubarb is amazing! I’m currently eating the whole continer of the passion fruit. SO GOOD, it’s better than ice cream!